Uber isn’t the only company getting into the spirit of Chinese New Year. WeChat, the Chinese mobile messaging app with 270 million active users, has stumbled upon a brilliant idea, which takes the seasonal tradition of gifting money — know as Hong Bao in Mandarin — into the digital era, as Tech In Asia notes. 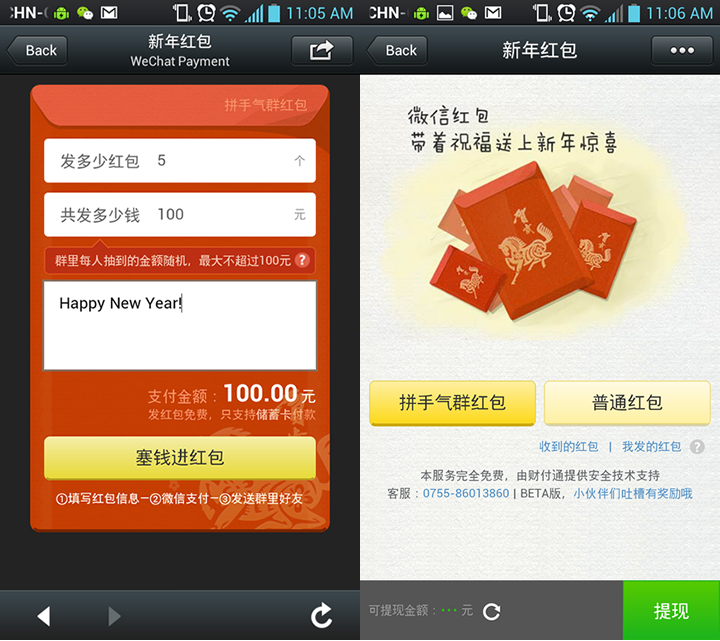 Rather than (or, perhaps, in addition to) giving red envelopes of money to younger family members and friends, WeChat users can tap into digital payments, and send presents up to 100 yuan (around $16.50) per go to others using the popular chat app. Money can be sent to single or multiple recipients — in the latter case, the cash is divvied up at random, adding some excitement to the process. Users simply link their bank account to the app to begin sending or receiving cash. Tencent, the billion dollar Internet company behind WeChat, is pushing interesting monetization models, such as ‘flash’ sales inside the app and enabling wireless payments. The Hong Bao activity, while an exercise in fun, shows just how widespread WeChat adoption is in China. It will also help fend off smaller rivals like Alibaba’s Laiwang app, which picked up 10 million registered users in its first month alone but has been less successful with its own hongbao promotion. Most importantly perhaps, it is a clever way to get users’ bank details on file for potential monetization in the future.